Declaration of Independence (1776) - The document that initiated a revolution. Not just with the birth of the American nation, but a revolution toward freedom and away from tyranny. The Declaration of Independence could be considered the offspring of the Magna Carta; only more evolved than its parent. The Magna Carta checked the power of the king and distributed some of it to the aristocracy. The Declaration of Independence stated that all humanity is endowed with "unalienable rights" upon which the king cannot infringe. Despite its grievances against the monarchy, none of the ideas contained within were new at the time. Thomas Jefferson, who authored it, admitted as much. The philosophies of John Locke heavily influenced the founding fathers. In addition, Thomas Paine's Common Sense, a pamphlet which swayed many colonists toward independence, was published only months before Jefferson wrote the declaration, and many of its ideas were incorporated as well. Even some of England's own parliamentary laws, such as the Declaration of Rights, were embodied in the document. The break came after England had enacted several burdensome taxes upon the colonists following the Seven Years' War. The conflict left the British government heavily in debt and it tried to recoup as much money from the American colonies as possible. It started with the Stamp Act of 1765, followed by the Townsend Acts of 1767. After these taxes were levied, some colonists began to question whether British Parliament had the right to impose them since the colonies were not represented in that governing body. With the passage of the Tea Act in 1773, some colonists stopped questioning and began defying. The famous Boston Tea Party was held in December of that year. The raid was conducted by the Sons of Liberty in Boston Harbor. Parliament responded by passing what the colonists referred to as the Intolerable Acts the following year. The goal was to punish Massachusetts and put an end to any more ideas of defying British authority. It had the opposite effect. Instead all 13 colonies took it as an affront to their sovereign rights, and the First Continental Congress convened in September 1774. By 1775, open conflict had broken out and war looked inevitable. 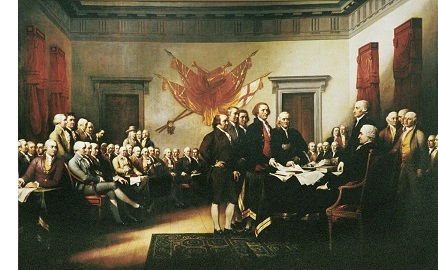 The Declaration of Independence was drafted in June 1776 during the Second Continental Congress and signed in July 4, 1776 and emphasized individual liberty over the power of an oppressive state. Great Britain tried to squash the rebellion and the American Revolution followed. The colonists gained their independence and won the right to govern themselves. Although self-governance had not been unprecedented in history, it was very rare, and re-introduced the concept that each individual had the right of self-determination (with the exception of the slaves which would be addressed in the American Civil War).